By this time, you have probably heard about the latest Google update known as “Hummingbird.” There is a lot of conflicting information about it, and it may be difficult to disseminate the important from the noise. There are three things you should know about Hummingbird: the timing, the scope and the idea. Even though the Hummingbird update was not announced until September 26th, according to Moz it was already in place on August 20th. If you noticed a change in your company’s Google search-traffic around that time, it is likely an indicator that you were affected by the update. Google has redesigned its search procedure, meaning it uses an entirely different approach to process searches. This is not just a “patch” on an existing search algorithm like Panda or Penguin; rather, in this case the core is algorithm is completely different. Amit Singhal, the head of Google’s core ranking team, estimates that the new search algorithm affects 90% of search inquiries. 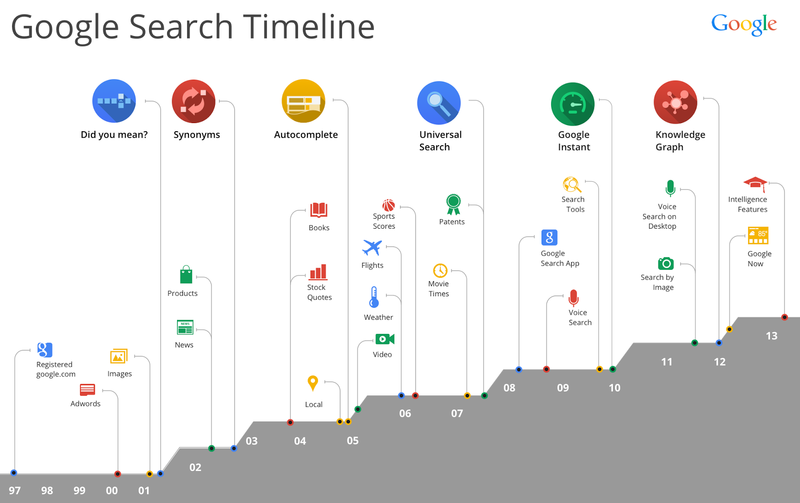 Over the years, Google has been consistently working to improve its search algorithm. Every couple of years, the company has introduced a new feature designed to help searchers find information more quickly and accurately. How do they do it? Google uses Knowledge Graph, synonyms and other enhancements(refer to the infographic above) to understand the essence and intent of the search query, and to then provide suitable search results to the user. Enough with the details. Now that you know about Hummingbird, you will want to know how this update will affect you and your business. Yes, this Hummingbird update is a big change. But that does not mean it is the end of the world, so don’t panic. Instead, assess the situation. You will hear a lot of advice about looking for changes in your rankings. Don’t do that. Rankings are not the end-goal of your marketing plan; rather, your goal is to receive qualified web traffic. With this update, there is little to no data available about the keywords. You should not be relying on a few high-traffic keyword rankings anyway. Go to Google Analytics and pull up your account. Select the dates between August 1st and November 1st (90 days will give you a clear picture). Filter your traffic to the following dimensions: Medium: Organic; and Source: Google. If your website was negatively affected by the update, you will see a drop in traffic after August 20th. Otherwise, you are in good shape. Here is how things look for a few of our clients. Each screenshot represents a website from different industry: legal, medical, insurance, and entertainment. None of these businesses were affected by the Hummingbird update. Guidance remains the same, it says: have original, high-quality content. Signals that have been important in the past remain important; Hummingbird just allows Google to process them in new and hopefully better ways. Stop thinking about tactical SEO and focus on holistic approach to marketing your firm. Period. Understand your target audience. Figure out what their search intents are, as well as their true needs and where they are in the buying process when they search for your service. Develop great content that is focused on your audience. Understanding your customer-base will help you deliver content that is specific to their true needs and interests and is written in a way that will appeal to them. Establish authority and visibility in the marketplace. You will need to have a process that markets your firm consistently. You should no longer engage in one-off marketing activities here and there. Provide a great experience for the visitors to your website. There are two sides to this: On the business side, you will want to increase the probability that you will convert visitors into paying clients. On search side, you will want to be sure that you are providing your visitors with the information or products they were looking for. In doing so, you also help Google deliver on its mission to increase the quality of search results. Do not expend any energy on panic about the changes; instead, use this energy to further your marketing goals. You have likely experienced a change in Google’s algorithm in the past. If not, be aware that you will most likely experience more of them in the near future. Most of the business owners who have been negatively affected by the most recent changes are those who rely on only one or two sources of web traffic. That’s a risk. You are putting all your eggs in one basket when you rely solely on SEO for your web traffic. There are other marketing channels you can use to generate traffic to your website. Test them and make the numbers work. For example, you may want to try using Google Adwords or Bing Ads. Some marketing personnel complain that pay-per-click advertising is too expensive; however, when it is set up properly, it can frequently generate high-quality traffic resulting in more phone calls or web inquiries for your business. Once you have multiple marketing channels set up and working well, an event like the Google Hummingbird update will not lead to too much of a disturbance, because you will know that other channels are humming at a full capacity. The internet is the future, and it will keep evolving. Do not look at updates and changes as the end of the world. If you want to stay in business, you must adapt. On that note, it is time to accept the changes and get busy. Good luck. Get tips from the experts to create leaner and stronger campaigns that increase sales and build a more profitable E-Commerce business. Tom Bukevicius (boo-ka-vicious) is a Principal at SCUBE Marketing, E-Commerce marketing agency delivering results through PPC & CRO. Tom’s motto is “Magic bullets are for losers. Execution is key.” Check out Tom’s new SCUBE Rating self-assessment to improve paid search campaign efficiency. Did you miss these 5 conversion optimization articles last month?